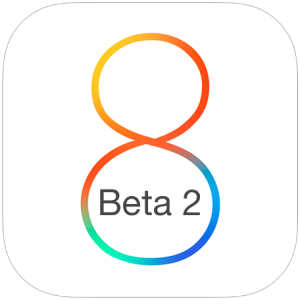 Apple has released iOS 8.1 beta 2 for those registered in the iOS Developer program. The latest build arrives versioned as 12B407 and is said to include bug fixes and feature improvements to the mobile operating system. 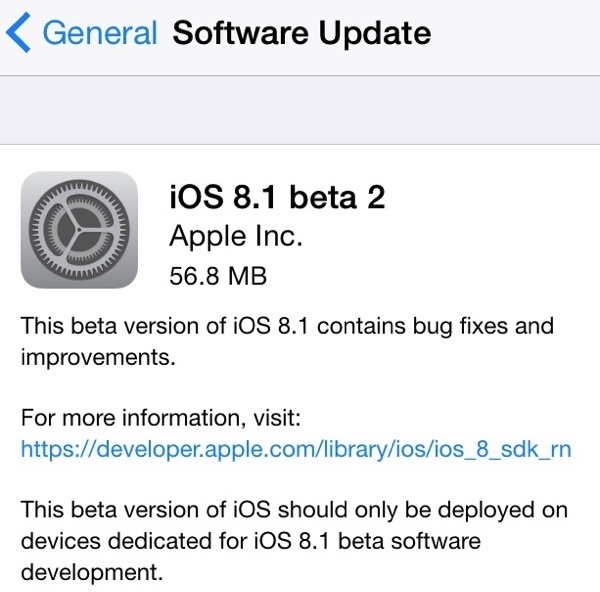 Users who are currently running the first beta of iOS 8.1 on a compatible iPhone, iPad, ro iPod touch will find the update available through the OTA mechanism in Settings > Software Update. The delta update is fairly small, ranging in size from 50MB to 80MB to install. Registered developers can also find the iOS 8.1b2 IPSW available to download through the iOS Developer Center. Separately, a new build of Apple TV software has been released, and Xcode 6.1 Golden Master 2 is also available to developers. iOS 8.1 is expected to bring Apple Pay support to devices which support the mobile payments feature, and is also hoped to resolve many ongoing bugs and quirks with the existing iOS 8 releases, ranging from crashes, wi-fi issues, Bluetooth connectivity problems, and seemingly random poor battery performance. At the moment, users on MacRumors Forums have not reported any new features or changes with iOS 8.1 beta 2.
iOS 8.0.2 is the most recent publicly available version of the mobile operating system. I have heard from multiple people that iOS 8.1 BETA is more stable than iOS 8.0.2. What does that say about the status of the current release we have? How is this even out? If the betas didn’t expire, everyone would be jumping on board. So, iOS 8, you’re horrible. iOS 8 is a crashprone turd, it’s hard to believe Apple released this onto the public. It’s half-baked at best. It crashes constantly, it makes touch screens unresponsive to touch, it makes wi-fi slow or not work at all, it makes Bluetooth devices fail or unable to connect, it drains battery. Why did Apple release this? They long dropped the ball, and nobody is cracking the whip so how could it be picked up? No wonder iOS 8 adoption is so poor, people have wised up and voted ‘no’ on updating to crapware. Hmm, odd, my lowly iPhone 5s is running just fine on iOS 8.0.2. No crashes, perfect bluetooth, no wifi problems, longer battery life, more flexibility. I would expect 8.1 to be an improvement. One Link to understand how this IOS 8 is a real poo! For some people only. I do empathize with them, but for the most, for several hundred thousand of us, iOS 8 works.